Here is your prime minister for life! NOT. The Executive Board of the ruling Republican Party of Armenia (RPA) has discussed the candidacy of the future prime minister of Armenia and the board members have unilaterally approved the candidacy of the third president of Armenia Serzh Sargsyan to be nominated for the post of prime minister. As RPA spokesperson Eduard Sharmazanov stated at the press conference following the board session, the ruling party is expected to officially nominate Sargsyan on Monday. Parliament, where the ruling party holds majority, will vote on the candidacy of the prime minister on April 17. In Sharmazanov's words, RPA Executive Board members highly value of Serzh Sargsyan's experience, his vision and approaches of the state development. He added, no names other than Serzh Sargsyan for the post of prime minister have been discussed in the meeting. It's a good start! I hope this inspires others as well that the country needs this. YEREVAN. – Fourth President of Armenia Armen Sarkissian will give his entire salary to charity. Hasmik Petrosyan, the person in charge of Sarkissian’s office, told this to Haykakan Zhamanak (Armenian Times; HZh) newspaper. “According to the latter [Petrosyan], Sarkissian has decided to get his salary and do charity [with it], but it is not clear yet as to which organizations the amount will be transferred to. (…). Armen Sarkissian had turned down his salary also during his years of working as ambassador [to the UK]. “To HZh’s other question—Will Armen Sarkissian live in the [presidential] service apartment?—Hasmik Petrosyan informed that, for now, he will live at his [own] home in the capital city [Yerevan]. “The President’s service house is located at the address of 74 Dzorap [Street] (…). Also, he will have a state-owned summer residence in Sevan [town] (…). He will be provided with a special motor vehicle. A personal doctor is set aside to track the Republic president’s health condition,” wrote Haykakan Zhamanak. Armenia’s changing political system: a parliamentary republic or the President’s third term? Armenia has just sworn in a new president and next week parliament is set to elect a new prime minister, concluding a controversial transition from a semi-presidential system of government to a parliamentary one. However, many remain sceptical. On Monday, Armen Sarkissian, a former ambassador to Britain, was sworn in as the country’s fourth president, while Parliament is slated to vote for a new prime minister on April 17. Sarkissian briefly held the prime minister’s post in the 1990s and has many high-profile connections in international scientific and business circles. As President, his new role will have a largely ceremonial function, while power will now be with the prime minister. On Wednesday, the ruling Republican Party of Armenia (RPA) announced its intention to nominate former president Serzh Sargsyan, who has been in office for the last ten years, for the powerful prime minister’s office. Amid criticisms that Sargsyan is simply maintaining his iron-grip on power, supporters say security reasons make his continuing rule necessary. Armenia is blockaded by Turkey and Azerbaijan amid an armed confrontation with the latter over the Nagorno Karabakh conflict. In April 2016, renewed fighting lasted four days during which hundreds died on both sides. Sargsyan’s plan for constitutional change dates back to 2014. The following year, a referendum on the constitutional amendment received a resounding ‘yes’ with 63% of the vote, according to official data. However, the political opposition disputed the results, which they claim had been rigged in order for Sargsyan to maintain his power. In July 2016, Sargsyan repelled an attempt to force him out of power. A group of armed men stormed and occupied a police patrol department, demanding his resignation. Over the following days, large-scale demonstrations were held in solidarity with the gunmen. After negotiations that lasted a little over two weeks, the gunmen agreed to surrender. Three police officers were killed, and dozens of citizens were hurt over this period. Following the events, a new government was formed with the appointment of former ArmRosGazprom chief executive Karen Karapetyan to the prime minister’s office. Davit Sanasaryan, an activist who participated in the demonstrations of July 2016, believes that unlike the authorities who have launched anti-democratic practices, civil society groups and some political forces are trying to start a democratic process by carrying out peaceful campaigns against Sargsyan’s leadership. “It’s not clear at this moment which way the scale will tip, the success of democracy depends on the society’s involvement, without which the situation created by the authorities will remain unchanged” Sanasaryan says. He believes if the ruling circles take sharp anti-democratic steps, the emergence of new armed groups and attempts to overthrow the government by force cannot be ruled out. “As a supporter of peaceful disobedience, I hope everything will be done to prevent possible armed struggles,” Sanasaryan says. Given the parliamentary majority of Sargsyan’s Republican Party and its coalition partner, the Armenian Revolutionary Federation (ARF), he is unlikely to face any obstacles to his election as premier. Outside the ruling coalition, the Tsarukyan bloc, headed by business magnate Gagik Tsarukyan, is also refraining from joining protests against Sargsyan’s leadership and is generally uncritical of him. It was also in favour of Sarkissian’s election for president. The Yelk bloc, which consists of three opposition parties, has been divided as only one of them – the Civil Contract party – has said it is prepared to take to the streets and fight against Sargsyan’s rule. “Improper sentences will always be handed in politically motivated trials, even if there is an element of crime,” she said. Nazaryan also accused the former president of reinforcing corruption in the electoral system, claiming that election bribes are disseminated ahead of each vote. “If he continues ruling the country, nothing will change. The society has adapted to this situation and doesn’t fight against it,” she added. A shift headed for democracy? Republican Party deputy chairman Armen Ashotyan, meanwhile, rejected accusations that the political shift was anti-democratic. “It’s hard to explain how a parliamentary model of government can be less democratic than a semi-presidential one,” Ashotyan said. Describing the opposition’s presence in parliament as unprecedented, the lawmaker says 40% of National Assembly represents the opposition, while a further 25% of the parliamentary leadership posts and 33% of standing committees are given to the opposition. The latter two, however, are comprised exclusively of the Tsarukyan bloc. According to him, the country is now in the process of obtaining a parliamentary government experience. “The current solutions certainly presuppose more transparent, democratic and participatory management than previously,” he says. Ashotyan also argued no official decision had been made on Sargsyan’s possible tenure as the country’s prime minister, and that critics of the ruling party misinterpret the current situation. “The RPA and its coalition partner ARF formed a majority in 2017, which means political decisions will be implemented by the political majority,” the lawmaker said. “So the issue of reproducing or continuing Sargsyan’s rule was not the question. This is only about the vote of confidence that the RPA received in 2017 and the formation of a new parliamentary system by 2022." Hrant Mikaelian, a political scientist and researcher at the Caucasus Institute, believes that the key goal of the shift in the form of government was to distribute power among the various branches of the government. The transition to a parliamentary system, according to him, was made by Sargsyan to ensure power was not concentrated in the presidential office after his possible departure as president at the end of his second five-year term. He believes that the political opposition’s chances of success are low, as people are disappointed with both the authorities and the opposition, and do not understand how they will benefit from any changes. 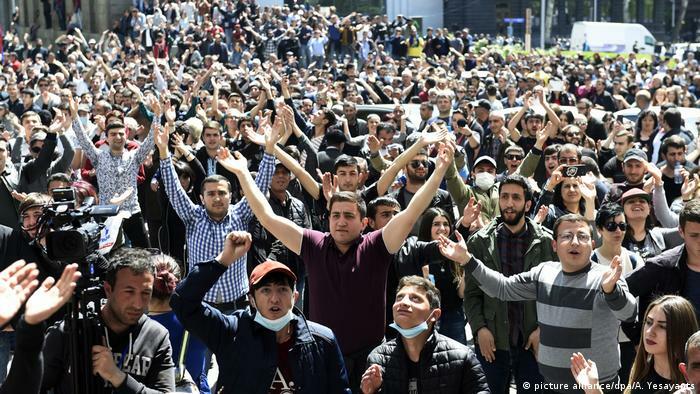 YEREVAN, Armenia (AP) — Thousands of demonstrators are crowding the square in Armenia's capital where four main streets intersect, paralyzing traffic in the center city. The crowd on Yerevan's France Square is protesting Armenia's recent change of government form that they see as a move for former President Serzh Sargsyan to stay in power. Leaders vowed late Friday to conduct the protest around the clock. Armen Sarkisian took over as president from Sargsyan on Monday, inaugurated under a new system in which the president's powers will be weaker and the prime minister will dominate. Sargsyan, whose party holds a majority in parliament, is expected to be nominated for the premiership on Saturday. Protest leaders say they will demonstrate outside the building where Sargsyan is expected to be nominated. 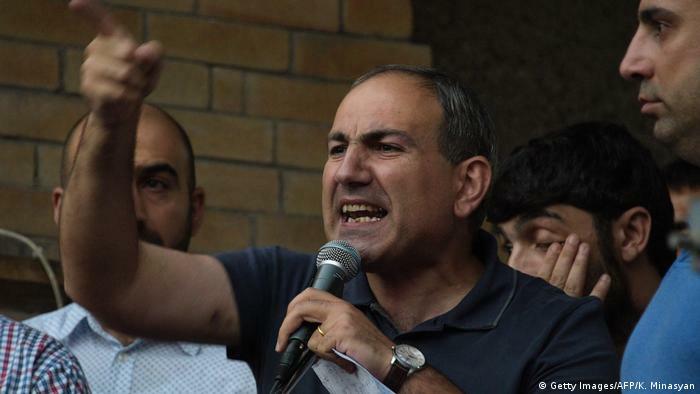 Nikol Pashinyan, an opposition MP and leader of ‘Civic Contract’ broke into the Public Radio of Armenia building today along with dozens of supporters who demanded to do a live broadcast. Guards attempted to prevent the crowd from entering the building but were unable to hold them back. This is a continuation of the protest movement against the former president of Armenia Serzh Sargsyan and his potential appointment as prime minister of the country. The demonstration began last night on Freedom Square. Nikol Pashinyan demanded a meeting with Mark Grigorian, the head of Public Radio of Armenia. Unable to meet with the latter nor to go live on Public Radio of Armenia, Pashinyan began speaking in front of other media outlets. The Radio-Free Europe/Radio Liberty Armenian Service provided live coverage of his speech and of the events inside the building. He then requested journalists to give him some time to prepare for a speech which was short. Pashinyan called on the people to come out onto the streets and join the protestors and the demonstrations which is continuing today on Freedom Square in downtown Yerevan. The aim of the round-the-clock demonstration is to prevent ex-president Serzh Sargsyan from becoming the leader of the country again by becoming prime minister. Pashinyan referred to Serzh Sargsyan’s statement saying that he would not run for a third term, nor would he attempt to run for the position of prime minister. Because Sargsyan did not keep his promise, the opposition leader and his supporters believe it their duty to do all they can to prevent Sargsyan from coming to power again after the country recently transitioned to a parliamentary system of governance. The purpose of the demonstration is thus: to gather as many people as possible on the streets and to surround the parliament building on 17 April which is the date set for the electing the prime minister. If the elections fail twice, then the current parliament will be dismissed and new parliamentary elections will be scheduled. In such a way, the opposition hopes to change the composition of the parliament and to break the majoritarian party’s hold on power, and thus, Serzh Sargsyan’s accession to prime minister. Pashinyan has announced over the past few days that if he is unable to achieve his goal, he will leave politics. He started this movement two weeks ago with an initiative called ‘My step’. Together with supporters, he walked some 200 kilometers across the country, from Gyumri up to the capital and called on people to come out in protest against Serzh Sargsyan. A large-scale demonstration took place last night, during which participants shut down traffic in downtown Yerevan and spent the night outside. Pashinyan says that there were less than 200 people. For that reason he believes that the demonstration must use all its resources to spread information to the public and get them onto the streets. The ruling Republican Party of Armenia, led by Serzh Sargsyan, put the latter forward today as its candidate for prime minister. The party’s meeting was held in Tsaghkadzor, not far from the capital. Ten years is enough, give others a chance and go away and enjoy the wealth that you accumulated during that time, God knows how? YEREVAN. – Armenian Public Radio resumed broadcasting after the protestors headed by Civil Contract Party leader Nikol Pashinyan left the building of the Armenia’s Public Radio and marched along the streets in downtown Yerevan. Earlier it was reported that the protesters broke into the building of the Public, demanding airtime to voice their protest against Serh Sargsyan's nomination for the seat of a prime minister. Being rejected airtime, Pashinyan said he would make a statement for the media. He urged the Armenian citizens to gather at France Square at 6:30 p.m. “to take care of the power that belongs to the people”. The politician left the building and promised to pay compensation for a broken door. The Civil Contract and their supporters have been marching throughout Armenia starting from March 31. On Friday they finished their action by a rally at Liberty Square. Later in the evening, Nikol Pashinyan announced the decision to spend night at France Square as a protest against ruling party’s decision to nominate Serzh Sargsyan for the post of a Prime Minister. On Friday the protesters shut down France Square, one of the busiest intersections in downtown Yerevan, and promised not to leave the square until the problem is solved. YEREVAN. – My Step initiative leader, opposition Civil Contract Party member and National Assembly (NA) “Way Out” (Yelk) Faction head Nikol Pashinyan, announced during Sunday’s rally at France Square in Armenia’s capital city of Yerevan that the first phase of their plan has been completed, and therefore they will start nonviolent civil disobedience. Also, Pashinyan said volunteers—pedestrians, protest car rally participants, and cyclists—will be signed up because active actions will begin on Monday. On March 31, the Civil Contract Party, led by Pashinyan, had started a protest march through several towns of Armenia—and whose objective is to prevent the third term in office by ex-President Serzh Sargsyan; but this time as the next likely Prime Minister—and which concluded on Friday with a rally at Liberty Square in downtown Yerevan, and then with a round-the-clock sit-in at France Square. Also, the protesters had announced that they plan to block the NA building as well as the houses of the ruling Republican Party of Armenia (RPA) MPs on April 17, so as not to enable them to take part in the next PM’s election at the special parliamentary session on that day, and during which the RPA will nominate Sargsyan as candidate for the next PM. The protests in Yerevan showed little sign of slowing down, and they forced ruling party officials to move a meeting out of the capital. Leaders of Armenia's ruling party decamped to a ski resort as protesters in Yerevan have taken over central parts of the city in an attempt to disrupt longtime leader Serzh Sargsyan from continuing his rule. Protests, which began on Friday, April 13, with an estimated 4,500 people, continued the following day with crowds that appeared roughly similar in size. Following the previous day's political speeches, Saturday's demonstrations had more of a carnival atmosphere: Traditional Armenian line dances were followed by hip-hop and pop music, interrupted from time to time with “Make a step, reject Serzh!” chants, which have become the slogan of these protests. Teenagers, young urbanites, and middle-aged Yerevan residents could be seen dancing side by side. The demonstrations didn't go unnoticed by the ruling Republican Party of Armenia. Protesters had vowed to block the party's headquarters on April 14, where leaders were going to gather to formally nominate Sargsyan – until a week previous, the country's president – as its candidate for prime minister. Instead, the Republicans abruptly canceled the meeting in the capital and convened in Tsaghkadzor, a ski resort some 35 miles away from Yerevan. There, the faction unanimously voted to formally nominate Sargsyan for the PM’s office. On the same day, the ARF Dashnaksutyun Supreme Council of Armenia officially endorsed Serzh Sargsyan. ARF is Republican Party’s partner in the governing coalition, although it holds only seven seats in the National Assembly. Being outfoxed by those in power, the opposition retreated to irony. “He was taken to Tsaghkadzor … Serzh Sargsyan was subjected to trafficking,” said Gyumri Municipal Council member Levon Barseghyan as he addressed protesters gathered in France Square, the central node of the demonstrations in Yerevan. Dropping the irony, he then called on all opposition forces to unite against Sargsyan’s prolonged rule. “I guess they can sort out other issues later,” he said. Meanwhile, Nikol Pashinyan – the opposition MP who led the first day of demonstrations – kept making headlines. Joined by a group of protesters and the press, he stormed the headquarters of Armenian Public Radio on Alek Manukyan street in Yerevan. In the building lobby, they were met by police guards armed with assault rifles, and Pashinyan and supporters held up their hands in a sign of peaceful resistance. Security eventually let them through, and Pashinyan made it to the studio where he accused state broadcasters of ignoring the protests and demanded live airtime to call on Armenian citizens to join in. About 100 protesters had stayed overnight on France Square after the first day of protests, and an equal number did the same Saturday night, some sleeping in tents, others gathered around fires. As of Sunday morning, the Armenian police had made no effort of disrupting demonstrations, in significant contrast to the police's handling of mass protests in the summers of 2015 and 2016, when they dispersed crowds violently. The mood among the protesters appeared celebratory. “I like it here, and I’ll come tomorrow at 6:30 pm again,” wrote Marine Mamikonian, a young architect who moved from Russia to Yerevan last year, in a text conversation with Eurasianet on Saturday night. YEREVAN (RFE/RL)—Thousands of people occupied a key street junction in the center of Yerevan late on Friday at the start of nonstop opposition demonstrations against former President Serzh Sarkisian’s apparent plans to continue to govern Armenia. “This is a campaign again Serzh Sarkisian’s third term in office and against the [ruling] HHK. This is a campaign against hopelessness and for dignity,” Pashinian declared in a fiery speech delivered at nearby Liberty Square earlier in the evening. The Republican Party of Armenia’s governing Council is expected to meet and formally nominate Sarkisian for prime minister on Saturday. Armenia’s Republican Party of Armenia-controlled parliament is due to vote for the next premier on Monday. In his speech, Pashinian said the protesters will march to the Republican Party of Armenia headquarters and try to disrupt that meeting. He also called for a march to the parliament building that will be aimed at preventing lawmakers from appointing Sarkisian as prime minister. The ex-president’s allies claim that he never explicitly pledged not to become prime minister. They also say the Republican Party of Armenia has a popular mandate to pick the next premier because it won the parliamentary elections held in April 2017. Sarkisian offered similar arguments last month. He cited the increased risk of renewed fighting in Artsakh and other security challenges facing the country. Serj must abandon plans of becoming prime minister if he wants to safe the little respect he gained as a president. Go away Sargsyan and take your brother with you! Opposition leaders have threatened to prevent a two-term president from becoming Armenia's premier under a new system. But police have warned protesters against taking further action, saying there could be consequences. 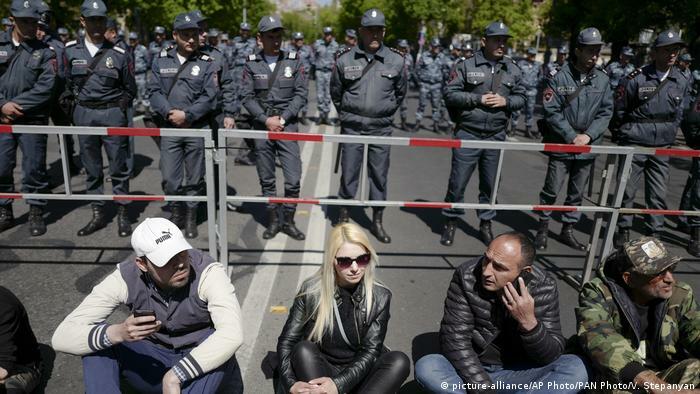 Armenian police on Monday clashed with protesters rallying in the capital Yerevan to stop a political transition largely seen as a power grab by former President Serzh Sargsyan. Earlier this year, Sargsyan ended his second and final term. However, parliament is set to approve him as prime minister on Tuesday as the former Soviet nation shifts to a new parliamentary system of government. Protesters have accused the former president of designing the transition to continue his hold on power but with a new job description. Thousands of people blocked traffic in the capital, chanting slogans such as "Armenia without Serzh" and "Serzh is a liar." "Our goal right now is to prevent Serzh Sargsyan from becoming the country's leader for a third time without violence and the use of force," said Nikol Pashinian, an opposition leader who led protesters in Yerevan. But police warned protesters against violating public order, saying there would be consequences. "Such actions can lead to crimes against the citizens' life, health and property," police said in a statement. Sargsyan rose to power in 2008, when he won the presidential election, an event that triggered mass protests and deadly clashes. Since then, he has managed to balance his pro-Kremlin policy with closer EU ties. Analysts have described his transition to the prime minister's office as a move practiced often in former Soviet countries. "Obviously, this is a mechanism that allows Armenia's current ruling elite to stay in charge. It's a familiar tactic in the post-Soviet space, where leaders endlessly tinker with their constitutions to perpetuate their power," said Thomas de Waal, a senior fellow at Carnegie Europe think tank. "Vladimir Putin made a similar gambit when his second term ended in 2008, even though in the Russian case there was no new division of powers." During Putin's time as prime minister, Russian law was changed to allow a former president to return to the post after a hiatus. The ruling Republican Party and pro-government Dashnaktsutyun Party formally nominated Sargsyan on Monday for the premiership. Parliament will put his nomination to a vote on Tuesday. YEREVAN, April 16. /TASS/. 46 people required medical assistance as a result of street protests in Yerevan, among them 6 police officers, Armenian Health Ministry said on Monday. "As of 16:30 (15:30 Moscow time) 46 people have required medical assistance in Yerevan, including 6 police officers," the ministry reported. Some of the injured were released from the hospital after receiving ambulatory care. "For the most part, civilians have received surface injuries of their lower limbs," the Health Ministry added. "The police officers have received injuries caused by blunt or sharp objects." One of the police officers had to undergo surgical treatment. There have been no life-threatening injuries, the ministry reported. On Tuesday, Armenians will go to the polls to elect the nation’s prime minister. The ruling Republican party of Armenia nominated Serzh Sargsyan, who on April 9 had concluded his 10-year tenure as president of the country. The opposition is launching acts of protest in order to undermine the election. 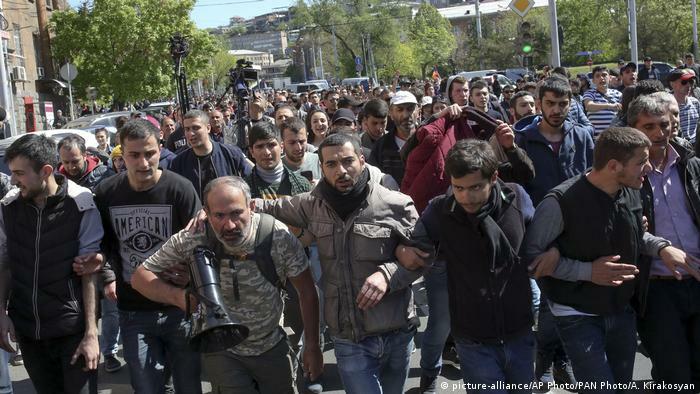 YEREVAN, April 16 (Reuters): Around 6,000 gathered in Armenia’s capital on Monday in protest at what the opposition calls a power grab by former president Serzh Sarksyan and several people were injured in scuffles with police. Hundreds of opposition activists have held rallies in recent weeks to protest at Sarksyan’s campaign to become prime minister after a constitutional amendment approved in 2015 that transfers governing powers to the premier from the presidency. The number of protesters has grown to thousands in recent days with protesters blocking the centre of Yerevan, capital of the former Soviet republic. A Reuters correspondent saw at least three protesters with blood on their hands and legs after scuffles broke out in the city centre. Local media quoted a hospital doctor as saying three policemen and one protester had been injured. Police warned demonstrators they would use tear gas and other means to disperse protesters if they did not leave the Opera House square and unblock the city centre. The ruling Republican party nominated Sarksyan, who served as president for a decade from 2008, as its candidate for prime minister on Saturday. Sarksyan’s ally Armen Sarkissian, a former premier and ambassador to Britain, was sworn in as president last week after being elected by parliament in a vote that was meant to herald the start of a power shift to the premier and parliament. Under the terms of an amended constitution approved in 2015 by referendum, the presidency will become largely ceremonial. Parliament, which is dominated by the ruling party, is to decide on Tuesday whether to install Sarkysan as prime minister. The Dashnaktsutsiun Party, the Republicans’ coalition ally, also backs Sarksyan’s candidacy, meaning he should easily secure the simple majority needed for election. No other candidates are running. Opposition leaders have accused Sarksyan of changing the nation’s political system to ensure he can remain in power. Sarksyan had denied any intention of becoming premier until March, when he said his appointment would allow him to share the benefit of his experience as president. Armenia, a country of three million people in the southern Caucasus, seceded in 1991 from the then-Soviet Union but still relies on Russia for aid and investment. Many Armenians accuse the government of corruption and mismanaging the economy. The ruling coalition’s joint session has just ended. As the NA Vice Speaker Eduard Sharmazanov said to journalists, Serzh Sargsyan’s candidacy was unanimously approved . The session lasted five minutes. Mr. Sharmazanov also noted that in a few minutes Serzh Sargsyan would present the relevant documents to the National Assembly. The thick heads in Yerevan must understand that Armenia is neither Russia, nor Azerbaboonistan, and the cheep tricks with the new parliamentary system wont pass. Opposition leader Nikol Pashinian declared the start of a "velvet revolution" in Armenia as protesters blocked government buildings in Yerevan. The ex-president was confirmed as the new prime minister despite protests. Police detained 80 protesters in the Armenian capital in Yerevan hours before the national parliament confirmed the former president Serzh Sargsyan as the new head of government on Tuesday. Tens of thousands of protesters took part in Tuesday's demonstration, staging sit-ins outside of government buildings, including the central bank and foreign ministry. Russian news agency Interfax reported that the area around the parliament building was cordoned off by police. Anti-Sargsyan protesters took to the streets of Yerevan last week and have been staging rallies against the former president ever since. On Monday, opposition leader Nikol Pashinian called on supporters to "paralyze the work of all government agencies." "I proclaim today the start of a peaceful velvet revolution in Armenia," he told a rally. But police warned citizens against violating public order, suggesting that such actions could "lead to crimes against citizens' life, health and property." Security forces on Monday used stun grenades to disperse the rallies, with 46 people seeking medical help, including Pashinian. Protests are expected to grow larger after Pashinian called on people to take part in "the largest rally in Armenia's history" on Tuesday evening. Despite protests against his rule, Sargsyan enjoys continued support from the ruling coalition. The ex-president stepped down last week after completing his second and final term. He is succeeded by career diplomat Armen Sarkissian. Serzh Sargsyan, a former military officer, previously served as prime minister from 2007-2008, before winning his first term as president in a disputed vote. He has repeatedly faced mass protests in the following years but remained the dominant politician of the landlocked ex-Soviet state. In 2015, his administration initiated a constitutional reform that transfers key elements of presidential authority to the prime minister, including the command of the army and the oversight of the security apparatus. We need a honest prime minister, not a puppet for Russia or the West. Someone who looks after the interests of Armenians only.